You know how you leave a place that you used to love and when you came back to it, it's lackluster? 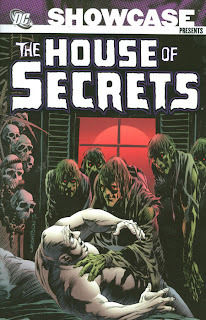 Well, that's the feeling I have with Showcase Presents: The House of Secrets Vol. 2, which collects issues #99-119 of that series. The first volume had Twilight Zone-level horror stories and cool endings. This ... well, this doesn't have that and it also doesn't have the writers (such as Len Wein and Marv Wolfman). What it does have are stories that don't fit, and often seem to take the reader for granted in the process. Usually, The House of Secrets is the main character of the book, but not this time. There's more focus on the stories than the house itself, but not in a good way. The writers could have found time to work in side stories and develop Abel's character, but instead Abel is presented as a complete 360 from his characterization in Vol. 1. It seems as though in the blink of an eye Abel has changed from a cowardly man (that is what was so great about him) to a smart mouth punk. In an introduction to one of the stories he says "So, remember -- even if you're a dummy (and most you readers out there are dummies), you can still have your revenge!" Maybe writer Steve Skeates thought this Abel would be more appealing, but it feels like an insult to the readership. As far as art goes, I still think these stories should be in color (yeah, yeah, economics, I get it) but it would really add so much to the story. A horror story (visually) is 50 percent story and 50 percent art. Would Psycho have had as much impact if it was just Norman Bates telling the tale? Now, to touch on some of the stories . . . I don't read linearly in these types of books, so the story I was drawn to was "The Demon and the Rock Star." Dean Taggert is a musician who wants it all and encounters a demon who grants him some of his desires. In return, the demon needs three victims. It is up to Taggert to select them by putting a jewel in each of the victim's pockets that is a signal to let the demon know which one to kill. One of the last victims is a girl he liked. She broke up with him so he gave her a beautiful gem necklace (that is, demon-tagged her) and went on to perform in his show. As with all horror tales, there is a twist. The girl couldn't accept the gem and instead sewed it onto his performance outfit; in the end he went down in an inglorious blaze. The plot hole is, if he could keep the gem before putting it in the victim's possession, then why did the demon kill him? While stories like the "The Demon and the Rockstar" suffer from time and greater audience maturity, there were also some that didn't make any sense to me at all. In "The Night of the Nebishi," Morty Kranz was a mousey man and took verbal abuse from his boss and then his wife. He would have nightmares about phantoms and dragons. He would wake up screaming (and sometimes with cold water thrown in his face via his wife) almost every night. Finally, he went to the hospital and stayed the night. That was also the night two aliens (a cross between the McDonald's fry kids and barbarians) landed and were going to take over the earth. But they didn't because Morty threw some sticks and stones and prevented the whole invasion. Your guess is as good as mine. I did find, however, two stories that were entertaining. One was a tale of dwarfs who were taken hostage by two circus owners in "A Carnival of Dwarfs." It gives the reader the feeling that all the abuse that these little creatures take was going to come back ten fold on the two men. It was nice to see that the writer, Michael Fleisher, threw in a red herring with a withered old-man about whom the dwarfs pleaded "But please don't hurt our old friend! Please!" The end had a feeling of Nosferatu meets Gulliver's Travels. And then there's the always wild "Abel's Fables." These short strips show hilarious bad situations. Highlights were a vampire ordering dinner and looking at the Maitre d' with hunger, and the violinist who lost his bow that ended up in an unpleasant place. Something that was new, not seen in the first volume, are the "Cain & Abel" comic strips, in the same vein as "Abel's Fables" but more about sibling rivalry than spookiness. Aside from the two decent stories, I felt this volume should be left up on the shelf; it doesn't even compare to its predecessor. Also listed others that have been talked about like BN: Green Lantern and BN: Green Lantern Corps as well as a number of collections that are not in current continuity (such as The Mighty, DC Classics Library Batman Annuals Vol 2, and others). As always with these far advance solicitations, there may be many changes in format, pages, contributors, and content before they actually come out.